Upon receiving your flower shipment, open the box as soon as possible and place your new flowers in a cool place. Your flowers will respond best to temperatures between 50 and 60 degrees F. If you should find your flowers slightly wilted around the outer petals, it is simply due to a lack of water while in transit to your home. Following are some proper care instructions that will help you get the most out of your newly purchased roses. Choose an appropriate clean vase and fill it with fresh, room temperature water. Add the included cut-flower food to the water. 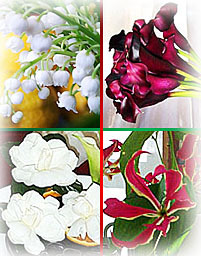 All various exotic flowers shipped from Beautiful Orchids include a packet of cut-flower food. Remove any foliage that will be below the level of water in your vase. This will help discourage bacteria growth and increase the life expectancy or your flowers. Fill a sink or bowl with water, the container should be large enough to thoroughly wet the stems while keeping you dry. Fully submerge the stem ends underwater and cut them at a 45-degree angle using a sharp knife, pruner or scissors. Flower stems can be cut to varying lengths, depending on the type and height of the vase in which you have chosen to showcase them. Cutting your flowers' stems at a 45-degree angle will ensure that they have plenty of surface area to absorb water and that they don't sit flat on the bottom of the vase. Water is just as important to any flowers as it is to you and me, so be sure to maintain a proper water level in your vase by topping it off every day. As if sufficient water wasn't enough, they also require clean water, so be sure to change your flower's water every 2-3 days to ensure maximum beauty and longevity.